The very first time I led worship here at Illumine, we used this song. I did not choose the songs that week (it was literally my first time ever even attending Illumine) and I must admit, I did not care for this song. It was quite different both lyrically and melodically than most songs I was used to using in worship so, naturally, it pushed me outside my comfort zone. Having used the song at least a dozen times since then, I can safely say this is now among my favorites that we use here at Illumine. However, that’s not really important. Who cares what I like? Let’s talk about what makes it great for worship and what contexts we have found it particularly valuable for. 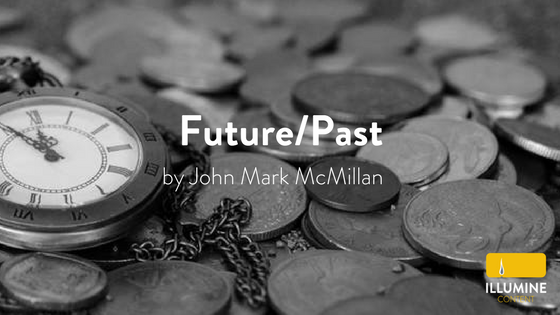 John Mark McMillan is an excellent modern poet who makes great use of metaphors to drive home biblical truths. In Future/Past, he uses several metaphors to drive home just how all-encompassing God is. There is no part of your life that God is not a part of (whether you acknowledge it or not is a different question entirely). He has been, is, and always will be in command and control of your life. It’s inescapable. This is certainly not the easiest song for a congregation to learn as there is a fair amount of syncopation in the melody and there are several different parts to learn (verse, prechorus, chorus, bridge). However, with a small amount of repetition, we have found that congregations do quite well with it (though we cut out the “whoas” as they are both tricky to sing and don’t add much of anything to the poetry). In what contexts have we found this song valuable? When we are trying to emphasize God’s power, his love for individuals, or his enduring love, though it is certainly not limited to those.